BSO Sheriff Scott Israel discussed someone he called a great man, Douglas High School football coach Aaron Feis. President Donald Trump's condolences for Wednesday's massacre at South Florida's Marjory Stoneman Douglas High School were met with fiery backlash from many corners, but none more dramatic than from some students and parents from the very school who survived the brutal attack. 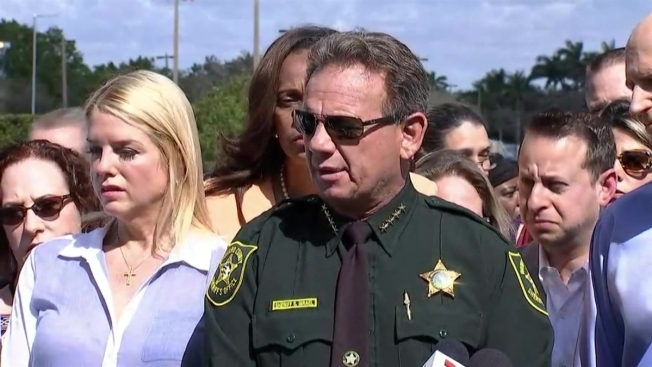 "How do we allow a gunman to come into our children's school? How do they get through security? What security is there? There's no metal detectors. The gunman, a crazy person, just walks right into the school, knocks down the window of my child's door and starts shooting, shooting her and killing her. President Trump, you say, 'What can you do?' You can stop the guns from getting into these children's hands! Put metal detectors at every entrance to the schools! What can you do? You can do a lot! This is not fair, our families and our children go to school and have to get killed! I just spent the last two hours putting the burial arrangements for my daughters' funeral, who is 14. President Trump, please do something. Do something. Action! We need it now! These kids need safety now!" Trump had said in an address to the nation on Thursday, "every parent, teacher, and child who is hurting so badly, we are here for you -- whatever you need, whatever we can do, to ease your pain." In an address to the nation, President Donald Trump offered his condolences to the victims of the deadly school shooting in Parkland, Florida. The address didn't mention guns. But at a vigil near the school that night, some in the crowd began chanting "no more guns!" David Hogg, a senior at the high school, had a similar a message to Alhadeff's for members of Congress during his own interview on CNN. "My message to lawmakers in Congress is please take action. Ideas are great. Ideas are wonderful and they help you get re-elected and everything. But what's more important is actual action. ... Children will continue to die if we don't take a stand now." Trump's tweet on Wednesday offering condolences also sparked a backlash. "I don't want your condolences you f---ing piece of s--- my friends and teachers were shot," tweeted one student identified as Sarah. She deleted the tweet, but screengrabs continued to circulate on Twitter. "Prayers won't fix this. But gun control will prevent it from happening again. Please stfu tomi." Another grieving student wrote a response rebuking conservative commentator Tomi Lahren's tweet that there was a rush from liberals to use the tragedy to push a gun control debate. "A gun has killed 17 of my fellow classmates. A gun has traumatized my friends. My entire school traumatized from this tragedy," wrote the student identified as Kyra. "This could have been prevented." Several others took Lahren to task while others had pointed questions for the commander-in-chief. Abbie Youkilis, aunt of 14-year-old Jaime Guttenberg who was slain in the Florida shooting, directed a message to all gun rights advocated in an emailed statement. "Why is your hunting hobby more important than my niece's life? ... I don't care that Nikolas Cruz did this. If it had not been him, it would have been some other sad sick young man. I do care that he was able to legally purchase an assault weapon." The gunman, a former student at the school, was booked into jail and charged with 17 counts of murder Thursday morning.